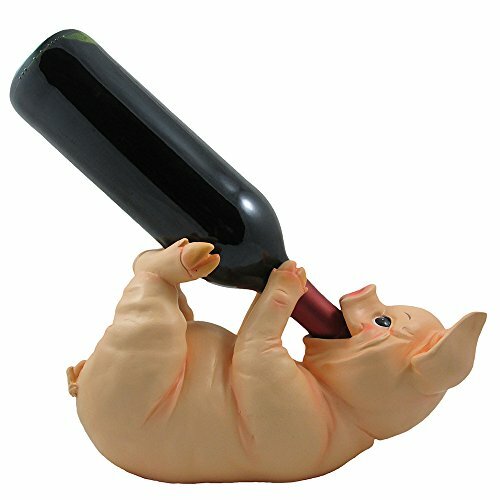 Greet your guests with country charm anyplace you choose to display this porky little pig who is always ready to serve up your favorite vintage. An intricately crafted sculpture that doubles as a tabletop wine rack, it is amazingly lifelike in detail and is sure to be a centerpiece of attention at your next party or gathering. This whimsical wine bottle holder adds just the right touch of farmyard charm to your country bar or kitchen counter! Greet your guests with country charm anyplace you choose to display this porky little pig who is always ready to serve up your favorite vintage. - See full description below. Dimensions: 11" x 5 1/4" x 6 3/4" high. Weight: 2.6 lbs. Individually hand-crafted from cold cast resin with felt pads on the bottom. If you have any questions about this product by Home 'n Gifts, contact us by completing and submitting the form below. If you are looking for a specif part number, please include it with your message.